At any age, holding students accountable for their learning can be difficult. I typically hear that they aren't mature enough, they don't understand it, or, the worst one, they don't care. But there has to be a way change all of that. And frankly, there is a way. It starts with the teacher first though. In this post, I'm going to dive into something that has become a labor of love for me and something I am still working on as well. I don't have all the answers, but I have a pretty solid foundation and feel as if I'm moving in the right direction. My goal though is for you to feel like you can walk away from this post and be able to have accountability in your classroom as well. Accountability is being responsible. Therefore, students are becoming responsible for knowing what to learn, how well they've learned it, and what to do if they don't know it/what to do if they do know it. As teachers, we know this about every student anyways. Every assessment or quick check we give should be informing us on how students are performing (formative assessments). We then make adjustments to our teaching or small group instruction (depending on what grade you teach) based on this information. So then how do we turn this information around for students to know all of this and having them make adjustments to what they're learning? I know you're already thinking, "I give their grades back to them and it's up to them on what they do with it." Tell that to a first grader who doesn't understand what a grade is or really means. Actually, tell that to my fifth graders who don't know that a 72 is a C and is definitely at risk. We, as teachers, have to shift our thinking and student thinking that a grade is a one time chance and once it's in the grade book, that's it for them. I never go change a grade in the books once it's entered, so don't get me wrong there. I do, however, give other opportunities to assess the same thing which they can show improvement. Grades should be used to guide a student to make an informative decision about what to do next, but that thinking has to be taught. This looks great right?! It gives students 2 opportunities to track their learning and they can track their test grade to see if they improved. My students were truly reflecting on their learning to see if they understood the standards or not and were able to see what they still needed to work on. Well... it was a good start, but doesn't align with my philosophy against the "one time hit" of grades. I used this for 2 years with my fifth graders when it finally came to me that my students were still seeing their test grade as a summative assessment when I saw it as a formative assessment. It was all because of that last column which didn't allow them to keep tracking their learning. I also heard, "This is a lot of stuff," which my response was always, "Exactly! Look at how much we're learning this year!" Not even thinking about how overwhelming or disheartening that must feel to a student who has straight D's or F's down the test grade column. 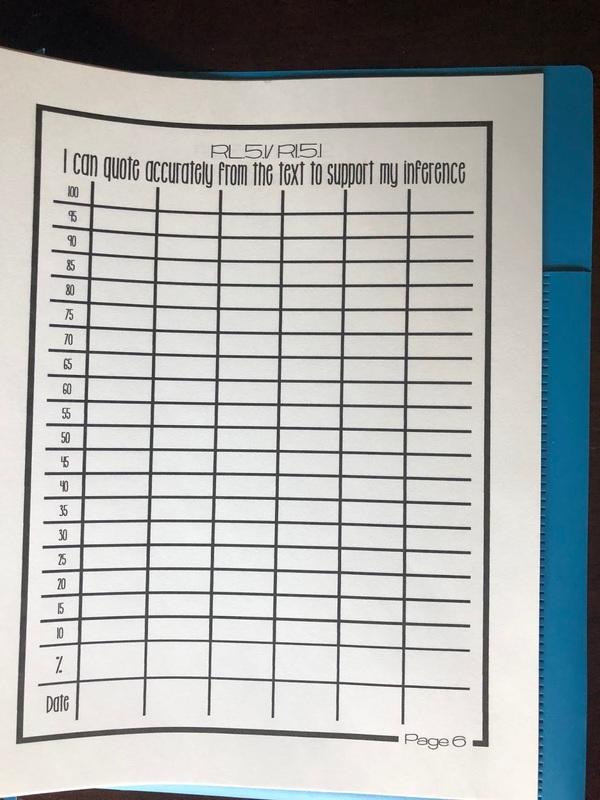 I do sell this tracker in my Teachers Pay Teachers store because it is a wonderful stepping stone for someone wanting to teach their students to reflect on their learning. Instead of grades in the middle columns, students use numbers 1-4 to determine how well they feel they're achieving that standard. This is a great beginning to taking ownership, as well as the conferencing questions that come with it for further reflecting. Be warned that there are downfalls to this though and should be handled carefully. Hang with me here because this is where it gets good! Before I even get into my new trackers, I tackle the issue of my students saying, "This is a lot of stuff." I, with many others, have determined my essential standards in my grade level. Essential standards are selected standards that are the most important for each student to be successful in that grade level, future grade levels, but most importantly, in life beyond school. These are the standards that they must know and you will track that student down and make sure they know it before leaving your classroom for the year. When I sat down with other 5th-9th grade reading/ ELA teachers, these standards all ended up being pretty much the same across the board, which makes since with how Common Core standards progress throughout each grade (ELA progression). This will vary by grade level, subject, and each 9-weeks for most. Teachers who know the standards they're teaching already know which ones are the most essential for student success, but I would recommend sitting down with people who teach the same grade and/or subject to figure these out together. This is step one, figure out the essential standards. The next step is to create multiple ways to assess students that goes with the essential standards. Doing quick checks is a great guide for me to see how students are doing, but in order to truly see if they know the information, I want to have at least 5 questions that goes with that standard. This will be a stronger guide for me to see if students truly know the content or not. There are many ways to assess without killing yourself to create rigorous assessments. One opportunity can be a pre-test before teaching the standard. Another can be my unit test, after you've finished teaching the standard. You can then add 5 questions to another unit test to "spiral" the standards (in the teaching world that's just keep the standard going throughout the rest of the year). You can create you own checks to do, but needs to be more than 1 or 2 questions and true to the standard, not a level above or below. There are lots of different ways to assess the essential standards and since it's just a few of them, it's not overwhelming for you or the students. The next part is where the students come in to take ownership of their learning. 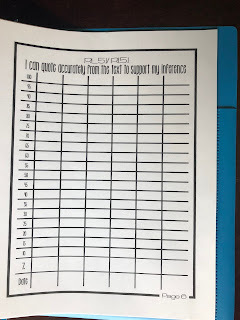 With these essential standards, I've made trackers where students can track each assessment to see their growth. 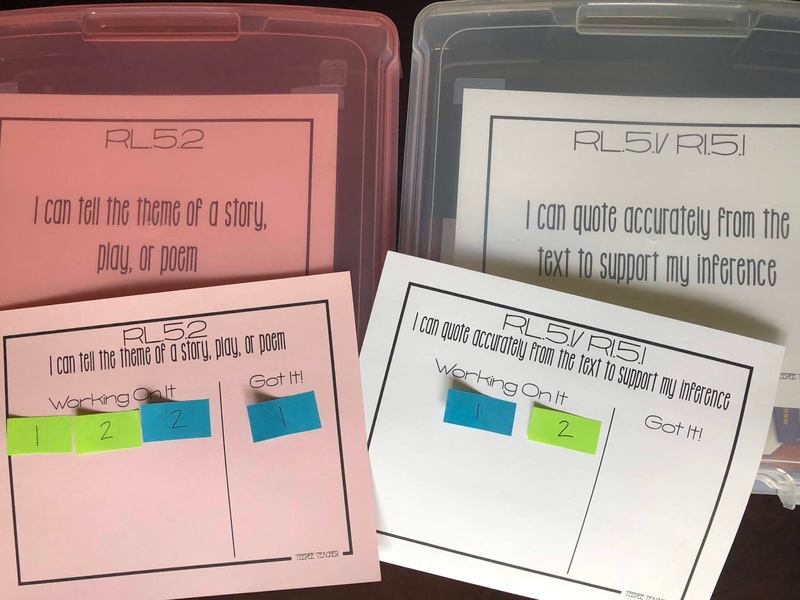 I keep these trackers in a notebook and students can see exactly how they're doing on their essential standards whenever they want. This resets the stigma behind grades for students because they can see that this one grade is not the end for them. Even if you don't take every assessment for a grade, they can at least see their growth within the standard that they know is crucial for them to learn. I also include conference pages, like the one shown earlier, for older students to have an opportunity to reflect and talk with me about their progress. The final step is to create opportunities for students to practice the standards that they have not mastered. However you define mastery (80%, 100%, etc.) is up to you, but students need to know where they stand with each essential standard and how to get help with it. 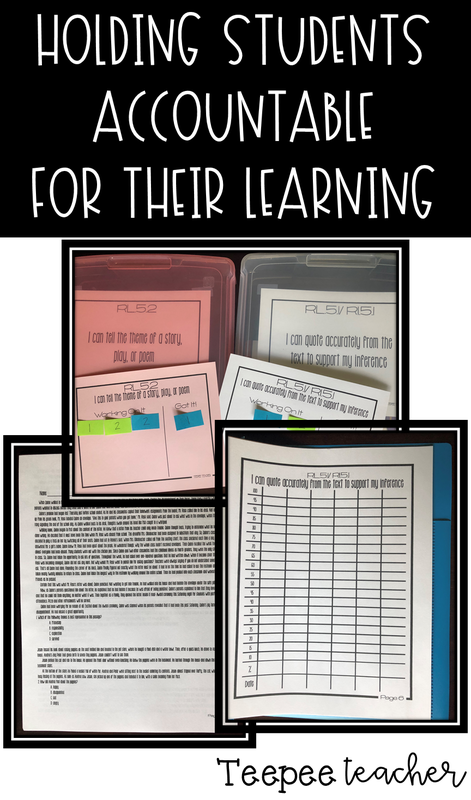 Using the resources and time you have in your day, make it available for students to be able to grab a game or task card or computer program and work on the standards. Once it's introduced, it should never go away! I use my small group time for when students can work on their unmastered standards. When I taught kindergarten, I used daily 5 for centers and had my essential standards into those categories. When they finished working with me, I would have them pick their daily 5 station for the day and they would color in the one they went to that day (see image below). By end of the week, they would have been to all 5 stations. On the wall were the standards on different colored paper with sticky notes with numbers on it that coincided with them. The data wall was a growing pattern of standards to work on. For example, "word work station" would have letter recognition which led into letter sounds then word segmenting/blending and finally sentence reading. When they went to the daily 5 station, they would go to the data wall to find the correct station that they colored in that day and look down to see which color they needed to work on. They would pull the center that went with that station color and began working. If you click on the image below to enlarge it, you can see the data wall with the daily 5 titles at the top, the colors with the essential standards on them, and then below the tree is how I organized my centers (the gray box). Each column of the gray box was a different daily 5 center with the title at the top and then colored clips (same colors as on the wall) were on each shelf that students pulled their centers from. It sounds complicated but even kindergartners could do it and made for a lot of success in my classroom! By the way, this stayed the same ALL YEAR LONG! I loved that most because I wasn't wasting time pulling different centers every week and explaining them to the class, just for them to not know what to do when they got there. With this, when I added new things, I would introduce it to them in small groups and usually to the group that was at that level. When I started to see majority of the kids in the same small group moving to a new level, I would pull that center to teach them so they knew what to do. 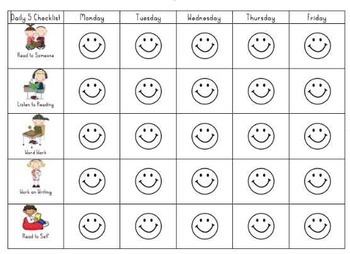 I am using an almost exact same method for my fifth graders, just without the daily 5 and my standards don't progress quite the same like they did in kinder. Nevertheless, I have a data wall with sticky notes for their number. When they are working on centers, they look to see which standard(s) they need to work on and pick the box full of activities. 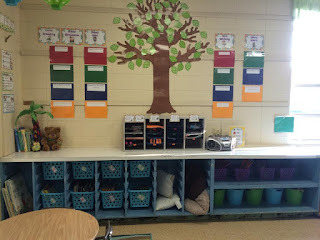 Since fifth graders a more independent, I don't have to organize it like I did with kindergarten. However, if kids are working on multiple standards at once (which they will be), they can pick whichever one they feel is most important at the time. Students who have mastered the standards also have the opportunity to go back and work on whatever center they want to practice again. There is no such thing as too much practice, however it shouldn't be boring for them so I always incorporate technology into the box's activity options that way I or the program can level it. 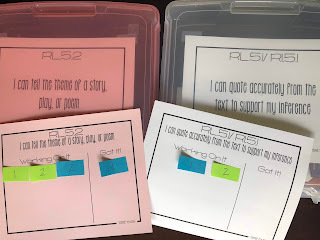 If you are a 5th grade ELA teacher, I have made everything that I talked about for you already! The essential standards, assessments, trackers, data wall, everything!! All you will need to do is figure out how you want your students to practice their unmastered standards. Click here to grab it. There are so many benefits to doing this with your students! It takes some back work, but students begin to see grades differently, develop a strong growth mindset, and become accountable for their own learning. From kindergarten to fifth grade, my students can tell you exactly what they're working on and why and even what they're good at and why! Isn't that powerful when they have ownership in their learning? That's what our goal is in education anyways, why not make it happen!